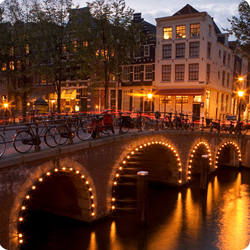 Join our special 4 day Christmas tour to Amsterdam. Travel by luxury coach with visits to both Brussels and Bruges. 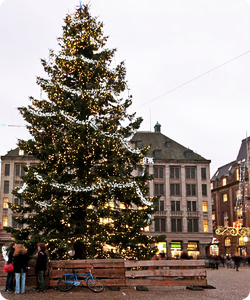 A 4 day Christmas tour to Amsterdam, with visits to Brussels and Bruges also included. Accommodation options include the excellent Winston in the City Centre or a very good quality 3 star hotel less than 10 minutes tram from the main attractions. Tour Highlights: A fantastic tour to Europe's most unique city. See Van Gogh Museum, take the Red Light District walking tour, join the excursion to the Cheese and Clog makers, taste a beer at the Heineken Brewery, tour Anne Frank House or simply experience the cafe culture. On day we include a visit to Brussels, and on day 4 a visit to medieval Bruges. St.Christophers at the Winston - A unique hotel in the heart of Amsterdam, located between Dam Square and the Red Light District, walking distance to the vast majority of major attractions the city has to offer. The Winston also has Amsterdam's one and only Belushi's bar with great food and drink promotions all year round and a funky nightclub 'The Winston Kingdom' where you can sample some great live entertainment. 3*Hotel - Upgrade to our 3 star hotel for only £50 per person per night. The hotel is located in Amsterdam centre, a short 10 minute tram ride to the main attractions. All rooms are nicely decorated and offer all the comfort one can expect from a hotel of this standard. The hotel has a bar, restaurant and 24 hour reception. Day 2 - After breakfast we begin the day with a morning coach excursion to Volendam. If it is typical of Holland you will find it here. Windmills, Cheese-makers, Clog makers and typical Dutch dress. We then head back to Amsterdam in time for the canal cruise to see this amazing city with our local Dutch guide from the comfort of one of Amsterdam's famous tour boats. then a free afternoon in the City Centre. Attractions open on Christmas day include Rijksmuseum and Anne Frank House, and spend some time in the famous Dam Square. Rest of evening free to enjoy the nightife of this unique city. Day 3 - A free day in Amsterdam centre. Enjoy a Diamond Factory Tour, enter one of the many fantastic museums (including Van Gogh Museum) and galleries, visit the Heineken Brewery or simply enjoy the famous cafe culture in this unique city.